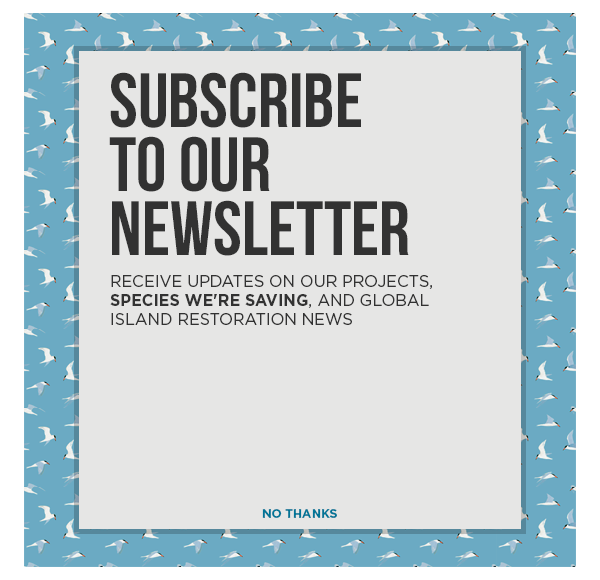 The world’s largest Albatross breeding colony returns to Midway Atoll National Wildlife Refuge every year, but predation by invasive mice threaten these seabirds. Fall on Midway Atoll is a time of quiet expectation as the tiny island in the middle of the Pacific Ocean awaits the return of over a million Laysan Albatrosses. Last week the first of the magnificent birds began to arrive, and soon they will be joined by over 70% of the world’s Laysan Albatross population. The birds return to Midway Atoll every year to lay their eggs and care for their chicks. But this year the birds face a growing and potentially devastating threat. This year, the staff on Midway Atoll are not just waiting for the birds to return; they are waiting to see if the crisis which began two years ago will continue to grow. We started trying to imagine what kinds of predators might have made their way to the colony. At first we thought it might be a migratory raptor like an owl or a hawk so we set up some automatic trail cameras. That’s when we discovered the mice. “It was pretty upsetting to come across this group of beautiful graceful birds and to find them bloodied along the backs of their necks and their shoulder blades. It makes a big impact on you,” said Aisha Rickli-Rahman. Rahman was the Biological Program Crew Lead on Midway Atoll at that time of the initial attacks. “The wounds were what you would expect if one animal was chewing on another.” said Flint. The mice were chewing through the skin, into the muscle and fat, and even into the birds’ body cavities. Most of the wounds were located on the backs of the birds’ heads, on their backs, and in some cases under the wings. Biologists do not yet know what triggered the mice to begin preying on the largest birds on the island. Mice are omnivores – meaning that they will eat any source of food they can find in their quest to survive – but although they had been present on Midway Atoll for decades, there had never been a single documented case of predation on adult albatross by mice before the 2015 hatching season. “Regardless of what caused them to start this behavior, it has the potential to cause an incredible amount of damage to this colony. And it’s a problem that we have to address” said Brown. This was something we had never expected to occur. Mice preying on adult albatrosses simply hasn’t been recorded here. Midway Atoll National Wildlife Refuge is located about 1,200 miles northwest of Honolulu within the Papahānaumokuākea Marine National Monument (PMNM), in the Northwest Hawaiian Islands (NWHI). Over three million birds, encompassing 29 different species, nest or winter on Midway Atoll’s three islands and all of them are susceptible to predation by mice. Hawaiian Monk Seals, Green Sea Turtles and Spinner Dolphins frequent Midway’s crystal blue lagoon encircled by coral, and the atoll is home to the largest albatross colony in the world and is the most important and successful breeding ground for Black-footed Albatross (Phoebastria nigripes) and Laysan Albatross (Phoebastria immutabilis). Among the three million seabirds who nest and rest on Midway Atoll each year is Wisdom, the world’s oldest known wild bird. Wisdom has been using the same nesting site on Midway Atoll since at least 1956, when she was first banded. As the mice attacks began to spread across the island, distressed staff began to post watches near Wisdom’s nest to keep her safe. For the staff and volunteers on Midway Atoll, the fallout from the attacks was difficult to watch. “To see these docile easygoing birds being eaten alive was pretty jarring,” said Rickli-Rahman. As the staff and volunteers began doing surveys to look for more signs of predation, they started finding higher numbers of abandoned nests than usual, “It looked like the birds had been attacked and then said I can’t take this I’m outta here. That’s a significant thing for an albatross, because they are very devoted parents,” said Fint. Albatrosses are tenacious incubators. It is incredibly difficult to get an albatross to leave their egg, and they will sit through weeks of hunger and thirst to protect it. “Once we confirmed that the injuries were being caused by mice we needed to figure out if it was a rogue individual mouse or if it was a widespread change that we needed to address,” said Flint. The attacks, which had begun in December 2015, continued to increase throughout the hatching and fledgling season but stayed confined to three small impact areas. “In that first year we had over 40 fatalities, and a couple hundred birds were impacted. We hoped it was a one time occurrence driven by climate conditions,” said Brown. The majority of seabird extinctions around the world have been caused by invasive mammals, in particular non-native rodents. For most of the island’s history, there were no mammals on Midway Atoll, or any of the islands in the Pacific Ocean, and so Pacific seabirds like the albatross evolved without any fear or defense mechanisms against mammalian predators like rats, mice, cats, dogs, or humans. When 2016 rolled around we were on the lookout for mice predation. And sure enough we started seeing the same attacks on albatrosses – only this time it was a much greater number of birds and it was much more widespread. It was across the entire island. From 2015 to 2017 there has been an exponential increase in mice attacks – both in the area on the island that is being impacted and the number of birds that being preyed upon and dying from their wounds. Part of the danger to the colony is that mice reproduce very quickly compared to albatrosses, which have a very slow pace of life. Albatross only have one egg every one to two years, and both parents invest a lot of energy into hatching and raising that chick. The incredible about of time and work necessary for albatrosses to survive to adulthood, find a mate, and become a successful parent means that each adult bird is incredibly important to the overall survival of the colony. “If mice started regularly preying on adult albatross we knew the potential was there for this to become a great big problem, not just for albatrosses but also for the other species of breeding seabirds at Midway,” said Flint. If we don’t do anything about this and that trend line continues up, we have the potential to jeopardize the health of the albatross population on Midway – the most important albatross colony in the North Pacific and the largest single albatross colony in the world.